Spring has sprung, and so has a mysterious rabbit around the Quad here at ISU. 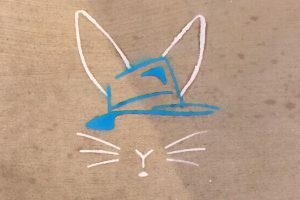 Among the native trees and historic buildings, you may have spotted a rabbit in a hat – except instead of being pulled out of a hat like any other bunny, this charming rabbit is wearing it. Wooley is a part of Design Streak Studio, a pre-professional graphic design studio operated by senior graphic design students and art directed by Associate Professor of Graphic Design, Archana Shekara. The studio provides multiple creative services to departments around campus as well as local businesses in Central Illinois. The sidewalk is not the only place that you might catch this bunny. Harvey may even end up hopping right into the palm of your hand. Catching this rabbit around campus comes with an advantage: the chance of winning two complimentary tickets to see Harvey in The Center for Performing Arts Theatre. If you pass by the chalked image or are handed a business card, simply post a photo to Facebook or Instagram, tag the School of Theatre and Dance at illinois State and use the hashtag #BunnyLove. Each post will enter you into the Monday, April 15. All nine of the posters designed by Design Streak students will be on display in the Center for Performance Arts Lobby during the run of the show. You can read more about Harvey and reserve tickets by calling the Center for Performing Arts Box Office at 309-438-2535 during box office hours Monday-Friday, 11 a.m.-5 p.m.
A special post-show talk with cast and crew, including director and ISU alumnus Robert Quinlan and dramaturg, Kee-Yoon Nahm will follow the Sunday, April 14 performance. All Illinois State University alumni can receive a special discounted ticket price for the April 14 performance by contacting the CPA Box Office.